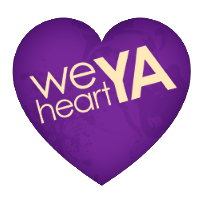 We Heart YA: Going Turbo! That title? 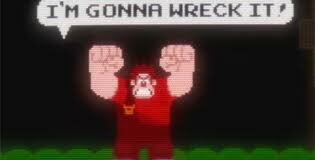 It's my new favorite phrase thanks to the Disney movie Wreck It Ralph. Have you seen it yet? It's stupendous. Mainly because of the storytelling. I wasn't one of those blown away by the humor (which relied on puns that went over the kiddunk's heads), or by the political correctness (it's Disney, 'nuff said). I was charmed by the "finishing line." And the world building. We know you all read (readers of the world, UNITE. Bangarang! ), and some of you write too. But did you know that once you cross that line between writing angsty (yet strangely efficient) poetry to novel-length fiction that you will NEVER be able to watch a movie or read a book again without seeing the mechanics? Yeah, NO ONE ever tells you that. When you write stories, you can't go back to being fooled by the man behind the curtain. You ARE THE MAN behind the curtain. There's no being gullible. You see the minions working all the strings, and then you imagine BIGGER minions with stronger strings. You see it all. But there's hope! Yes, there's hope. Every once in a while you read a book that makes you forget that there are strings. You see a movie, and you think it's going in one direction, and you say, "Okay, this is the 'all is lost' minion stringing me along...I see you, minion! Let's just skip to the end because I'm bored now." And then something magical happens. The story glitches. (Glitching is good now, friends). You forget your way. You're at a traffic light and you have no idea how you got there. You are quite happy to be an oversized, smelly oaf riding on the back of a frosting-coated race car on a sugar rope race track. And you can smell the mentos. You gotsta love a story that does that. Ralph, you Wrecked It!! 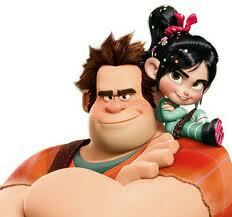 I can't wait to see Wreck It Ralph, and even more so now that you've gushed about it! Also, um, totally stealing DOBAS from you. I love it when the strings disappear, when a story seems more like it's been discovered than invented. That's the best. @Kristan...yes, hi-tch camo may just do the trick. I have every faith in your tricksy-ness. @Steph...thank you so much for lending me your book that I have lovingly spoken to, knitted a sweater for, and now made a comfy spot for while it waits for its owner. i have not read daughter of smoke and bone but i do have a copy. 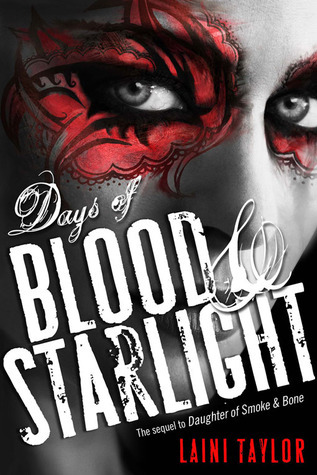 i am contemplating just buying book 2 since many have been giving the series high praise. @Chelley...hey, it might not be your thing. And that's cool. But as for DOSAB and DOBAS, I think Laini Taylor is one of the best storytellers in this generation. I'd be surprised if you didn't like her series. Go to it, darlin'!! It's official, I need to see Wreck It Ralph! I definitely know what you mean about the "strings." It's the best books that make you forget them until you finish. 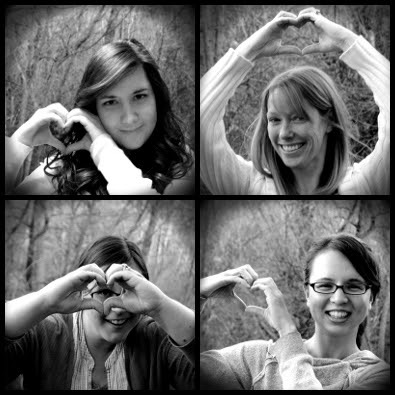 @Sara...I hope you like it! And then we must discuss the genius of Sarah Silverman's character voicing (or whatever it's called). One book I remember like that is 'The Girl of Fire & Thorns'... I remember reading it and going "wow, I didn't see it going that way" .. which, let's face it, when you read as much as we do is rare.